Wallabies are marsupials related to kangaroos. A marsupial is a mammal with a pouch to contain its young. Though they are often confused, there are many differences between the two marsupials, including color, habitat and body structure. Like kangaroos, wallabies have powerful, big tails. Though they are not prehensile (used for gripping), wallabies do use their tails to maintain balance and to hold themselves in a sitting posture. The natural habitat of the wallaby varies by group, such as the brush, rock, swamp, forest and shrub wallabies. They especially like more rough terrain such as heavily wooded areas, cliffs and granite bedrocks. Rock wallabies live in the southern desert on “almost vertical rock walls” according to the San Diego Zoo website. Red-necked wallabies have a more versatile habitat. One of these is on the mountains of Tasmania. 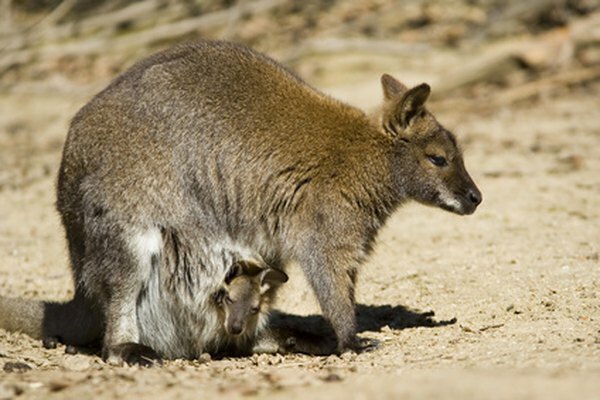 From birth, wallaby babies are small, vulnerable and weak. In their mother’s pouch they continue to grow and develop for at least a couple of months. Wallabies mostly live in Australia and the surrounding islands. The bridled nailtail, or flashjack, wallaby is another species of wallaby whose habitat range extends from the north in Queensland to farther south in New South Wales. Wallabies are herbivores. They eat a variety of plants such as grasses, sedges and leaves. They have long jaws and big, flat teeth made for chewing grasses and other plants. Often wallabies travel in search of food and water. Large groups of wallabies frequently gather around water holes. One of the few natural predators of the wallaby is the Tasmanian devil. There have been some species that were introduced, such as foxes and cats, that became predators of the wallaby. These introduced predators are thought to be the reason for the mainland extinction of the rufous hare wallaby. 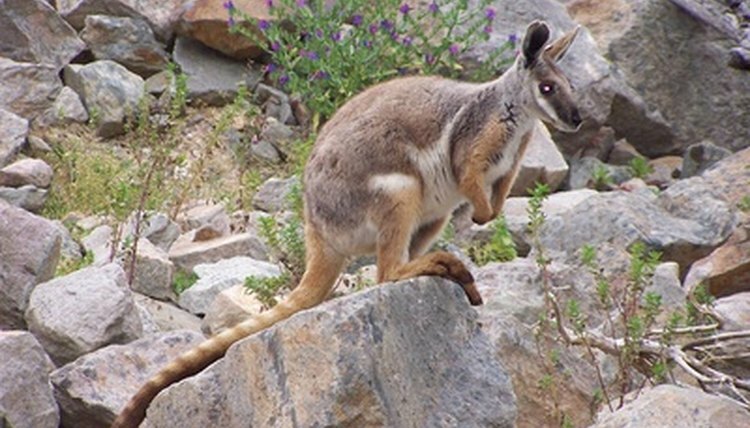 As of 2010, the black-footed rock wallaby is close to extinction for the same reason. 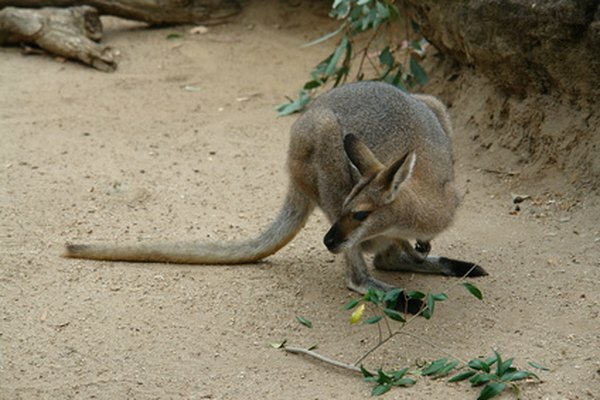 One of the wallaby’s defenses is its strong hind legs, which it uses to strike at predators. The largest threat to wallabies is habitat loss. With European settlement, a lot of native bush was cleared to make room for grazing and agricultural land. Further land development has wiped out a substantial amount of diversity within their natural habitat. Changes in climate are also affecting wallabies. The World Wildlife Foundation is working together with community groups to protect their natural habitat.